THP1-HMGB1-Lucia™ cells are designed to monitor necroptosis and inflammasome-mediated pyroptosis, two forms of necrotic cell death characterized by the release of the alarmin HMGB1 (High Mobility Group Box-1) upon cell membrane rupture. Pyroptosis is a consequence of inflammasome activation. Typically, inflammasome activation is a two-step process. A first signal (‘priming’), provided by microbial molecules such as lipopolysaccharide (LPS), induces NF-κB-dependent expression of pro-IL1β. The second signal, provided by structurally unrelated microbial molecules (e.g. Nigericin toxin) or danger signals, triggers inflammasome multimerization. This leads to caspase-1 self-activation, proteolytic maturation of IL-1β and IL-18, and cleavage of Gasdermin D (GSDMD). Subsequent GSDMD pore formation at the cell membrane elicits a rapid cell death associated with the release of IL-1β, IL-18 and HMGB1 [1,2]. Necroptosis is mainly implicated in conditions of disease or infection and is triggered by the formation of a necrosome. The necrosome is induced upon Tumor Necrosis Factor (TNF) receptor or PRR activation in absence of caspase-8 and cIAP (cellular inhibitor of apoptosis) activity. The necrosome contains receptor-interacting serine/threonine-protein kinases RIPK1 and RIPK3, and the mixed lineage kinase-like MLKL. Phosphorylated MLKL relocalizes at the plasma membrane where it drives cell lysis and release of HMGB1, most probably through pore formation . THP1-HMGB1-Lucia™ cells are derived from the THP-1 human monocytic cell line and stably express a HMGB1::Lucia-luciferase fusion protein. These cells respond to commonly used inflammasome inducers and necroptosis cocktail inducers. The release of the HMGB1::Lucia protein in the extracellular milieu upon pyroptosis or necroptosis can be readily measured using the QUANTI-Luc™ detection reagent. Levels of IL-1β can be measured by Western blot, ELISA or using InvivoGen’s HEK-Blue™ IL-1β cellular assay. Alternatively, secreted IL-18 can be detected using InvivoGen’s HEK-Blue™ IL-18 cellular assay. THP1-HMGB1-Lucia™ cells are resistant to Zeocin™. 1. Broz P. and Dixit V.M., 2016. Inflammasomes: mechanism of assembly, regulation and signalling. Nat Rev Immunol. 16:407-20. 2. Kovacs S.B. and Miao E.A., 2017. Gasdermins: effectors of pyroptosis. Trends Cell Biol. 27:673-84. 3. Grootjans S. et al., 2017. Initiation and execution mechanisms of necroptosis: an overview. Cell Death Differ. 24:1184-95. Pyroptosis response of THP1-HMGB1-Lucia™ cells. Cells were primed with 1 μg/ml LPS-EK for 3 hours and then incubated with inflammasome inducers : 8 μM Nigericin (left panel) or 0.5 μg/ml complexed Poly(dA:dT) (right panel). Lucia luciferase activity and LDH release in the supernatant were quantified at 2, 3, 4, 5 and 6 hours post-induction. The Lucia luciferase activity was determined by measuring relative light units (RLUs) in a luminometer using QUANTI-Luc™ detection reagent. Results are presented as the fold increase over non-induced cells. The LDH release was determined using a commercially available LDH cytotoxicity assay. Results are presented as percentage of the maximal LDH release measured in positive control. Necroptosis response of THP1-HMGB1-Lucia™ cells. Cells were pre-treated with the pan-caspase inhibitor Z-VAD-FMK (25 μM) for 1 hour prior to incubation with TNF-α (100 ng/ml) alone or in combination with the cIAP inhibitor BV6 (5 μM). As a control of necroptosis induction, Necrostatin 1(NS1; 30 μM), a necroptosis inhibitor was added to the TNF-α and cIAP mix. Eight hours later,, the Lucia luciferase activity was determined by measuring RLUs in a luminometer using QUANTI-Luc™ detection reagent. Results are presented as the fold increase over non-treated cells. Growth medium – RPMI 1640, 2 mM L-glutamine, 25 mM HEPES, 10% heat-inactivated fetal bovine serum (FBS; 30 min at 56 °C), 100 μg/ml Normocin™, Pen-Strep (100 U/ml-100 μg/ml). 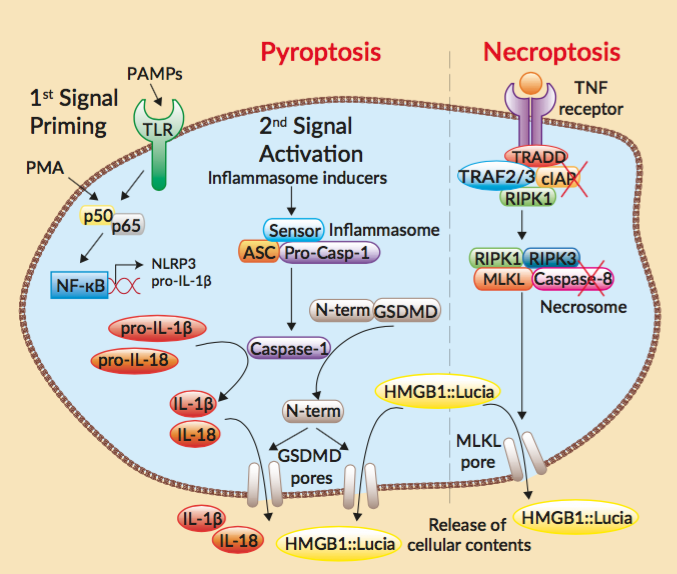 The functionality of THP1-HMGB1-Lucia™ cells was tested using inflammasome inducers, such as nigericin. This product is covered by a Limited Use Licence (see Terms and Conditions). 100 µl Zeocin™ (100 mg/ml). THP1-HMGB1-Lucia™ Cells are shipped on dry ice.